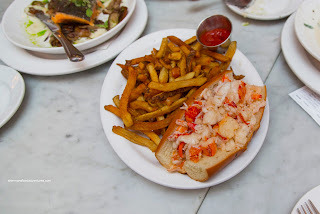 So our first lobster roll in Boston was at Luke's and the bar was set pretty high already due to the quality and reasonable price. 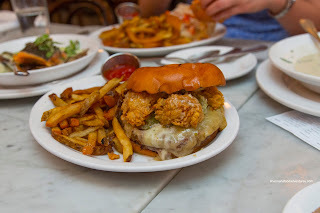 We then went high end with our visit to Island Creek Oyster Bar and had a totally different version with a more dressed version and a denser bun. 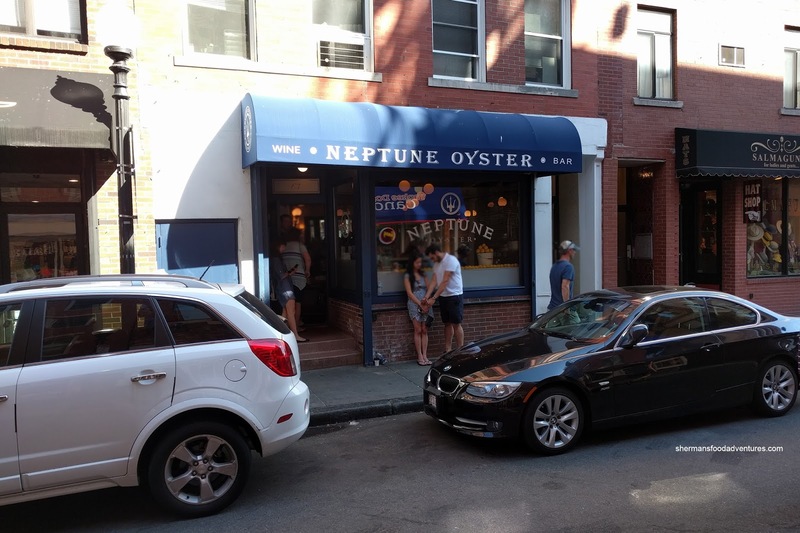 However, the one roll that was in the back-of-my-mind was the infamous version from Neptune Oyster in the North End. There was a big problem though - they don't take reservations and sometimes the wait can be hours long (also due to the small space). We ended up waiting 2.5 hours for a table and in the meantime, finished the Freedom Trail. 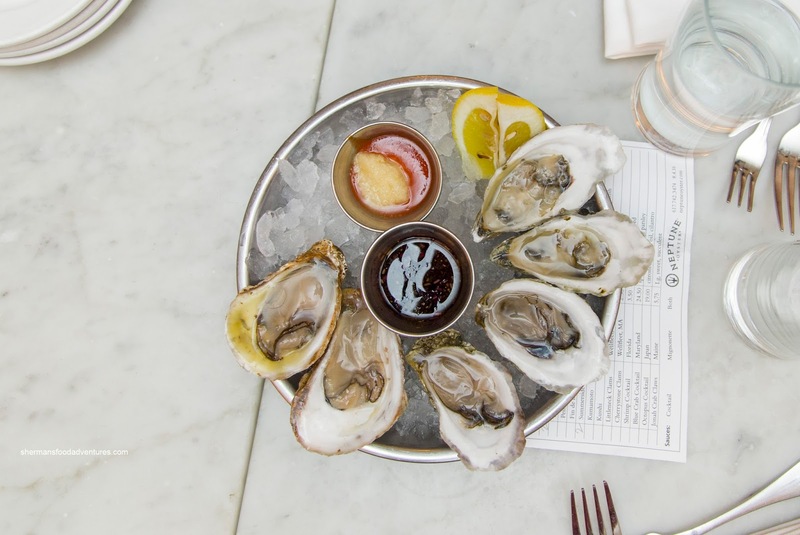 Before we got to the mains and the lobster roll, we celebrated National Oyster Day with 1/2 dozen consisting of Thatch Island, Bee's River and Summerside. These were shucked well except for one which had a few shell fragments. All were really fresh, briny and creamy. I thought the Bee's River had more of a mineral finish though. For the 3rd time in Boston, we had a bowl of Wellfleet Clam Chowder, yet this one was made-to-order with live clams. Hence, the flavour was really fresh and briny rather than plain salty. Of course being fresh, the clams were chewier, but they were still buttery. 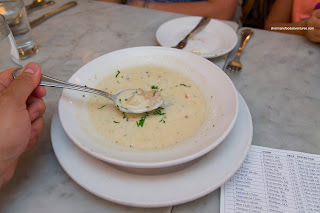 I found the broth to be more soupy than chowder-like. I didn't mind this as it wasn't too heavy. Okay, getting right down to it, we dug into the large Maine Lobster Roll featuring lobster stuffed into a soft, warm and sweet roll. It was over-stuffed with large chunks of lobster which were springy and super sweet. I have to say that the lobster meat was practically perfect with an appealing bounce texture and chewiness. Seasoning was on point while the amount of butter was sinful, yet at the same time, super tasty. Even the side of fries were good being crispy while still potatoey inside. We also got the Neptune Burger prepared medium-rare. The meat was tender and juicy while meaty at the same time. The whole thing was flavorful with the abundance of melted aged cheddar, garlic mayo and crunch of the tangy relish. 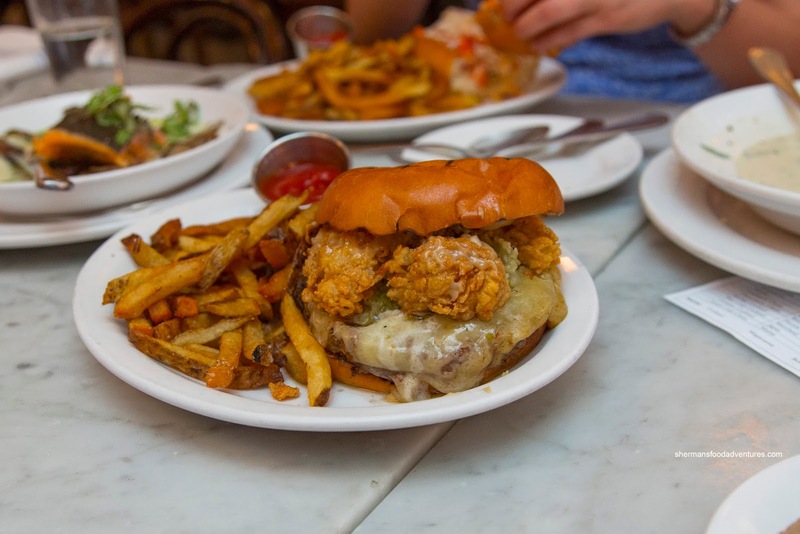 To top it off, literally, were 3 fried oysters which provided even more moisture, crunch and a sweet brininess. 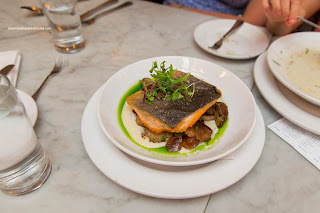 Lastly, we got the Roasted Icelandic Char with celery root puree, forest-harvested shiitake mushroom and olive oil. For us, this was also perfectly-prepared where the center was still rare. Hence, the fish remained buttery and tender. It was beautifully seasoned where the natural sweetness of the fish was enhanced rather than masked. Underneath, the buttery and aggressively-salted mushrooms were tender and super tasty. Okay, a 2.5 hour wait is pretty ludicrous and if I actually had to stand in line, I wouldn't even consider it. But given the circumstances and the outstanding lobster roll, it was certainly worth it in this case.